Egeria densa (Brazilian egeria) is a common aquatic perennial (family Hydrocharitaceae) that occurs in lakes, springs, ponds, and streams. Its underwater growth significantly retards water flow and decreases reduces the abundance and diversity of native plant seeds in lake bottoms. 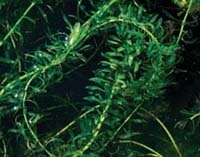 It was introduced as a freshwater aquarium plant.